The Panther defense aggressively collapses on the ball. 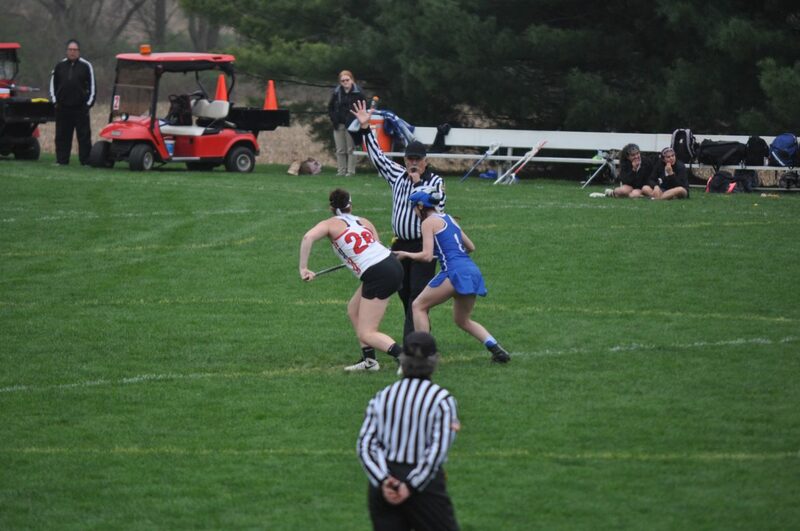 The day after a setback against the Easton Red Rovers, the Saucon Valley Lady Panthers defended their home turf against the visiting Pleasant Valley Bears. Perhaps a little shaken after crashing from the highs of the big, championship caliber game against Easton, the Panthers did not play their best. But, they were able to shake off the sluggishness and finish the contest with a 15-8 victory over the Bears. Saucon Valley improved to 6-3 while the Bears fell to 3-6. 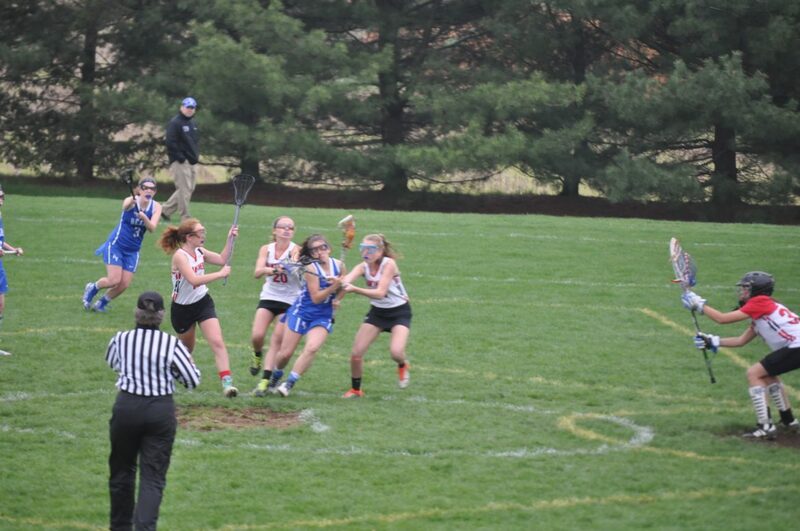 Panther sophomore Katherine Naiburg pressuring the Bear defense. Early goals by Camryn Zavacky and Madison Stump gave the Lady Panthers a 2-0 lead. Pleasant Valley however, was able to answer at 18:37 to make it a 2-1 game. The Panthers responded with four unanswered goals. Two more scores by Zavacky, along with another by Stump in addition to an unassisted goal by Brooke Riefenstahl made the score 6-1 with 7:39 remaining in the first half. Pleasant Valley proved they would not die easily and finished the half with three scoring strikes. 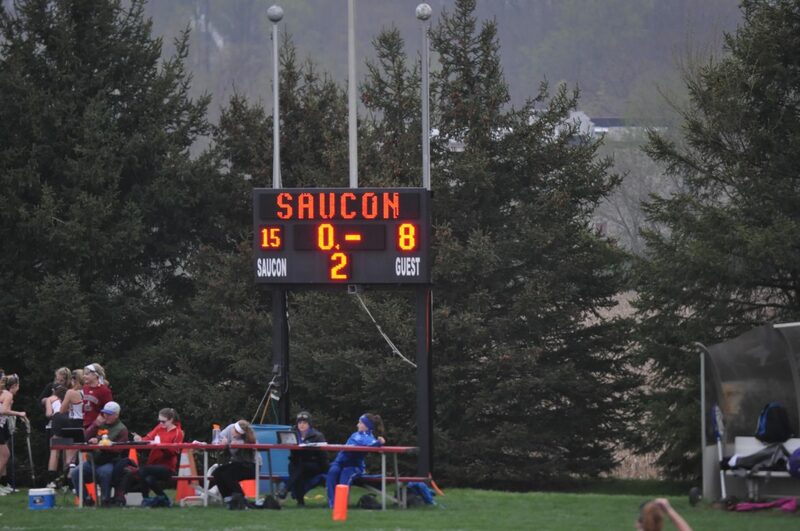 Saucon held a slim 6-4 advantage at halftime. Freshman Camryn Zavacky funnels her girl as sophomore Kiele Riefenstahl looks to double-team. The Panthers came out of the halftime break and dominated the first ten minutes. Sophomore Brooke Riefenstahl hit paydirt in less than a minute off a great feed from Katherine Naiburg. 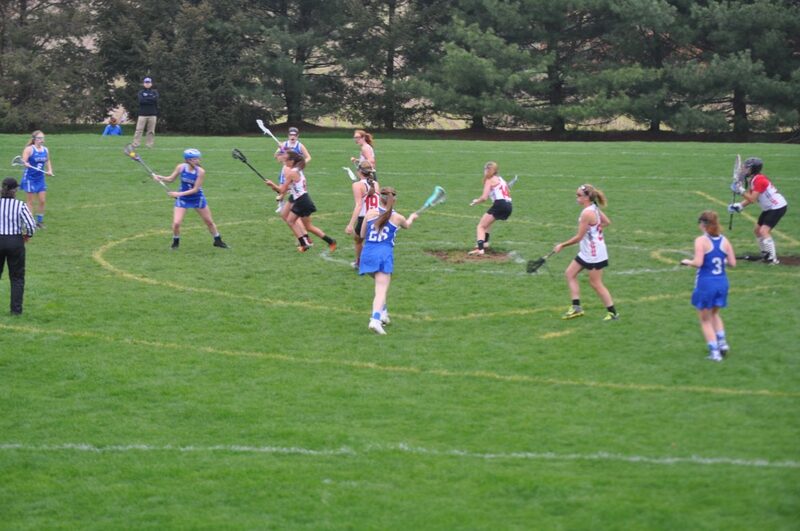 Maddie Stump quickly followed Riefenstahl’s goal with a sweet, back-handed scoop shot at 19:36. Junior Panther Helen Kreshollek takes the draw. Saucon Valley sophomore Siobhan Coakley then hit Naiburg in full stride with a sweet pass that “Battle-Kat” buried in the back of the Bear net. Naiburg then fed a cutting Megan Bredbenner for another Panther goal. Naiburg would go on to finish the game with a goal and at least three crafty assists. The Panther onslaught continued when Kiele Riefenstahl lit the scoreboard after she nimbly split two Pleasant Valley defenders and scored with a bouncer. Bredbenner then converted a free start with a laser to the top shelf. Kiele Riefenstahl finished the Panther run on goals with her second score. With 11:02 left to play in the game, the Panthers led 13-4. The Pleasant Valley Bears trying to solve the Panther defense. 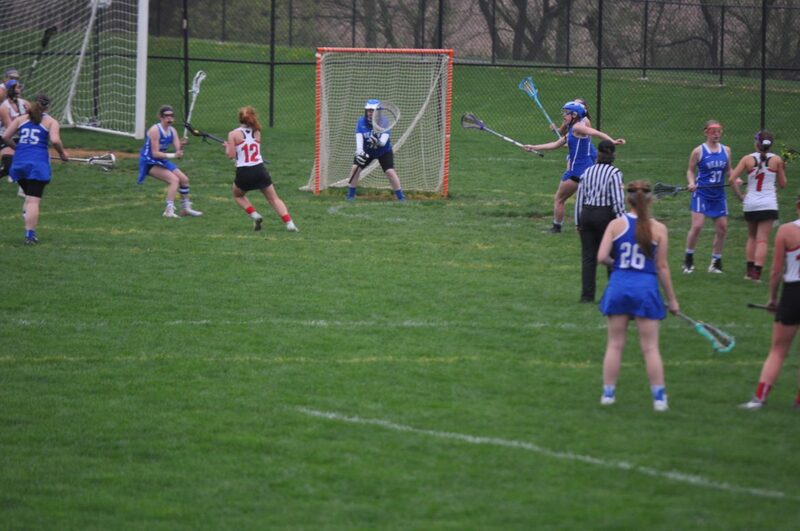 It wasn’t until the 10:40 mark that Pleasant Valley earned their first goal of the second half. The Bears would score three others, but the Panthers also received goals from juniors Maddie Zyck and Helen Kreschollek down the stretch. It wasn’t the best Panther performance, but they did earn another tally in the win column with the 15-8 victory. The Panthers are back on the winning track and improved to a 6-3 record. 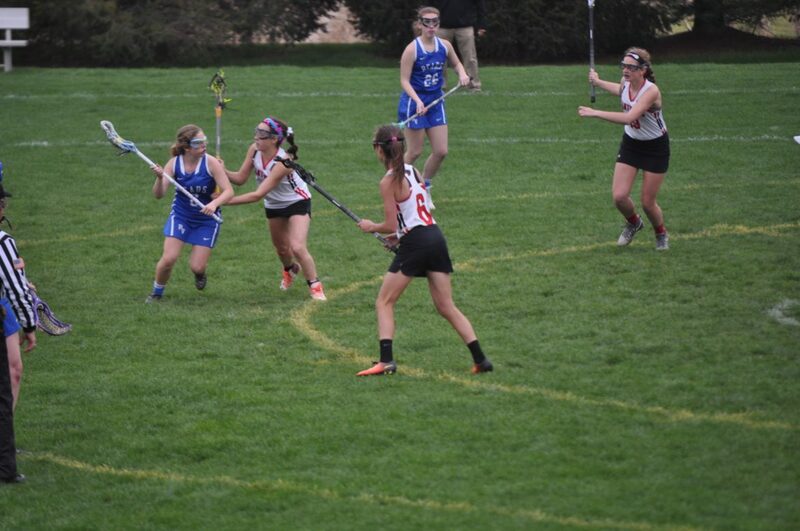 UP NEXT: Saucon Valley Girls’ lacrosse is back in action on Monday, April 24th at 4:30 p.m. against Liberty. The Lady Panthers with their 6-3 record lead the Independent Division of the Lehigh Valley and are looking for more.